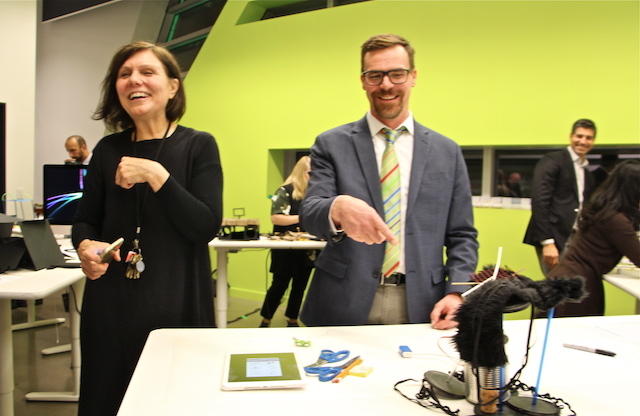 November 23, 2018 – More than two dozen principals from twelve schools took up the invitation this past week to discover the link between technology and art at the Anvil Centre’s New Media Gallery and Learning Lab. The tour was inspired by the recent Memorandum of Understanding between the City of New Westminster and New Westminster Schools promoting digital innovation in education. As Gallery directors Sarah Joyce and Gordon Duggan explained to their guests, technology and art are as ancient as prehistoric cave paintings – and as natural a fit with each other as technology is with engineering, math or science. In fact, the New Media Gallery at the City’s Anvil Centre has not showcased a single painting, drawing or sculpture made by a human hand since it opened, Duggan noted. Instead, leading artists are featured for their work that incorporates technology in ways that are creative, and that profoundly challenge our perspectives. 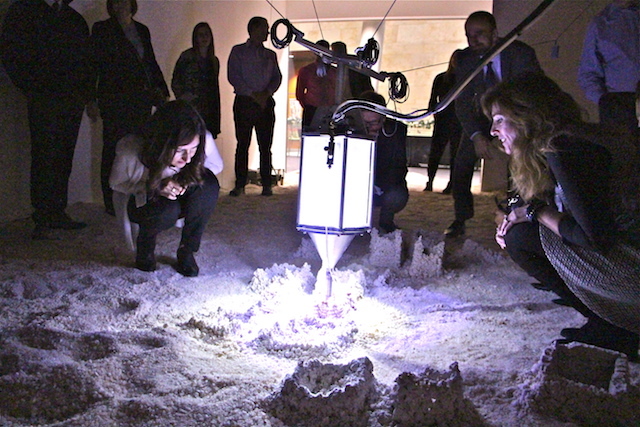 The link between technology and art was demonstrated as school leaders walked across a gallery room floor covered in 9 tons of rock salt. Here they witnessed the landscape beneath their feet being actively reshaped before their eyes. In the work Detritus by New York artist Jonathan Schipper, a computer directs the movement of a funnel-shaped extruder as it mines the salt, mixes it with water and slowly extrudes it. The result is a growing collection of small and recognizably human structures – a civilization rising up from the terrain on the gallery floor. As the structures dry, they crumble – enacting a story of humanity shaping and reshaping the landscape. 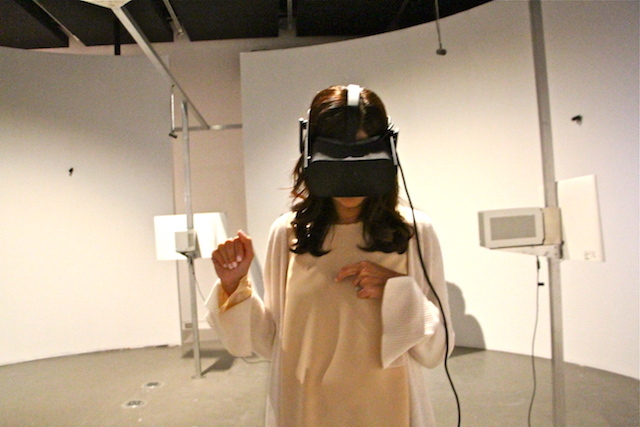 School principals and administrators were then invited to put on a headset and immerse themselves in what has been for many a deeply moving experience of Anishinaabe artist Lisa Jackson’s virtual reality landscape – set in a post-apocalyptic Toronto. In Biidaaban, First Light, Jackson worked with the National Film Board of Canada to create an interactive world that situates viewers in an eerily silent subway overgrown with weeds, and on top of a pockmarked high-rise rooftop where they can survey a destroyed city as the sun begins to rise. The only sign of human presence is indicated in fish drying on racks, a woman silently digging in the ground below, and a dome-shaped structure evoking a sweat lodge — a sacred, spiritually and culturally meaningful space of healing. The exhibits are as engaging for adults as they are for children and school groups, who together have been visiting the gallery in record numbers, Duggan said. A highlight for K-12 students is the creative learning space next door, known as the Learning Lab. Here, they can explore in workshops their own ideas inspired by the exhibits they see. The dedicated teaching space incorporates innovative and fun technologies for students to use – including a giant collection of ‘littleBits‘, or electronic gadgets that snap together to create circuits that generate sound, light and movement. Last week, it was the educators who took on the creative learning challenge. They assembled into teams and were invited to create a structure that could visually and sensorily convey meaning: of happiness or sadness, of anger or calm. They could incorporate ‘littleBits’ technology and recycled materials – and use their imaginations. The results were clearly entertaining. Another structure was in fact a non-structure referred to as ‘the thing”: – it was collapsed and deflated, covered in black paper, and conveyed a sense of depression. Another structure telegraphed in its feathery lack of substance summer breezes and a feeling of happiness. The newly signed Memorandum of Understanding between the City of New Westminster and New Westminster Schools will strengthen a dynamic exploration of innovative technology and support the ability of students to thrive in a new digital economy. The goals include enhancing connections in the school district and the City between creative learning spaces, as well as supporting collaboration in identifying future knowledge, skills and resources that learners will need in digital media and technology. “At New Westminster Schools, our students are engaged in everything from maker spaces and design thinking in the earliest grades, to robotics and digital media in upper-level sciences and arts,” said Mark Gifford, New Westminster Schools Board of Education Chair, who signed the partnership agreement last month with Mayor Jonathan Cote.